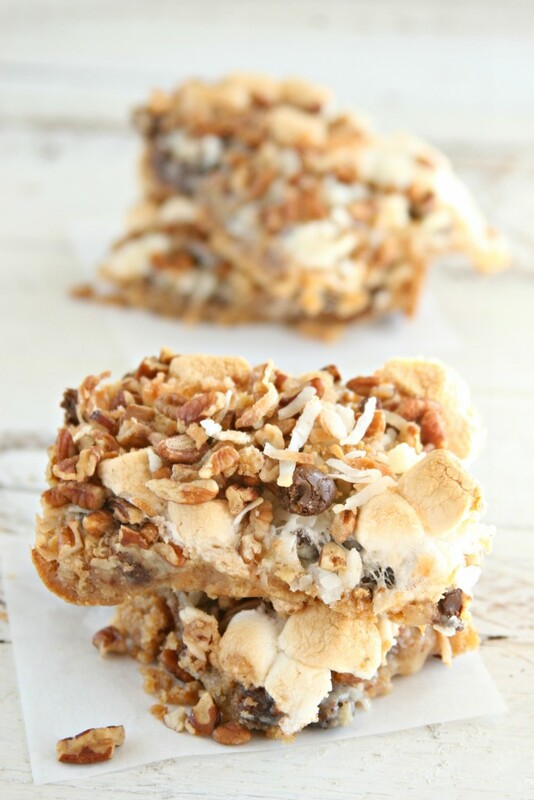 Crushed graham crackers, melted chocolate, gooey marshmallows, pecan pieces, along with toasted coconut make this delicious S’more Bars. There is nothing quite like warm and gooey S’more bars on a cold winter night. Cuddle up with your favorite blanket and enjoy one of these yummy treats after dinner. 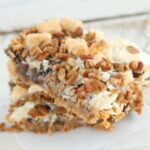 Very similar to a magic cookie bar- but with the addition of mini marshmallows. With this particular house, we have an electric stove. I can honestly say that personally, I would never install an electric stove in any kitchen. The heat is too uneven in the oven and you can easily burn anything on the stove-top. But, we have to work with what was in this house. Without a gas stove, I find it difficult to make s’mores in the winter. This recipe satisfies my s’more cravings. Crushed graham crackers, melted chocolate, and gooey marshmallows with toasted coconut make this delicious S'more Bars. Spray a 13x9 baking pan with cooking spray. Set aside. In a medium bowl, combine the melted butter and graham cracker crumbs. Spread evenly in the baking pan. Press down with either a rubber spatula or your hand. Sprinkle the chocolate chips evenly over graham crumb mixture. Pour the can of sweetened condensed milk over. Spread with a rubber spatula. Layer the remaining ingredients. Press down gently with your hands. Bake in a preheated 350 degree F oven for about 30 minutes or until lightly golden brown. Let cool on a wire rack. Cut into bars. 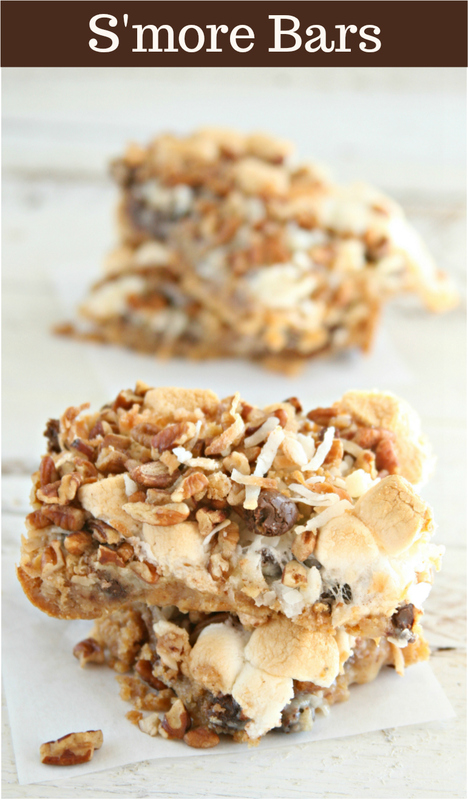 You had me at s’more, then you tell me a bar…yum! I am making this for a party this weekend and I know they will be a hit!